Pancakes!! Today is Asher's birthday. Before we got on the road for our mini-vacation, I made breakfast. It was actually a really quick meal to prepare. I'm taking the weekend off for the #30DaysofFood challenge but will be back Monday with new recipes and maybe a couple of bonuses to make up for the missed days. Dice 3-4 strawberries (small dice) and set aside. Slice the remaining strawberries and put in a small bowl. Sprinkle about a tablespoon of sugar over the sliced strawberries. Add 1 ½ tablespoons of honey bourbon to the bowl. Stir gently, cover with plastic wrap and set aside. * In another bowl, whisk together flour, sugar, baking powder and salt. Set the bowl aside. In a third bowl, whisk together milk, vanilla, butter and the egg. Add dry ingredients to the milk mixture and whisk until just moistened. Add diced strawberries and stir fully into the batter. Heat a large skillet on medium heat. Add a teaspoon of butter (you can swap the butter for oil if you prefer) to skillet and allow to melt (watch it closely and don’t allow it to burn). Pour batter into skillet and allow pancake to spread to the size you want. Cook until the surface of the pancakes has bubbles on the top (especially around the edges). Flip the pancakes and cook on the other side for about 1-2 minutes. Continue this process** until you’re out of batter (makes about 12-15 normal sized pancakes). 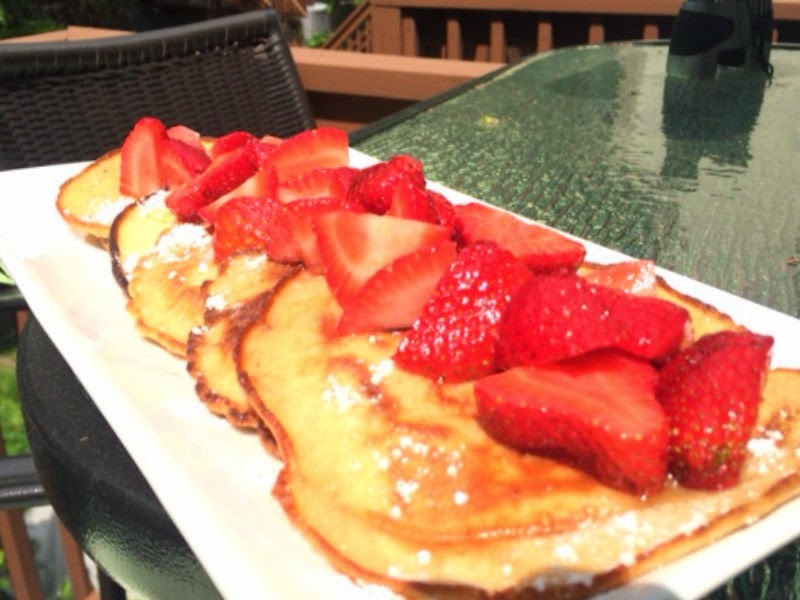 Top the hot pancakes with powdered sugar and the macerated strawberries. *You should macerate your strawberries for about 30 minutes. **While you are cooking, you can keep your cooked pancakes warm in a 200 degree oven. ***Basic recipe from Martha Stewart with slight modifications.